« Antelope in the Valley? The Hindley family of Honeydew. From Mary Rackliff Etter's collection, where there are many more like it. Here is another randomly-found letter that tries to explain the members of a family picture. A few years ago, I wrote to Wendy Lestina of the Ferndale Museum about this photograph of the Hindleys, which was on a page with several other sittings of the same large group, taken in roughly the same period. I had asked Laurence Hindley (of Fortuna; the guy who collects and fixes up all the old farm and tractor equipment, including steam engines) and he couldn’t tell for sure who everyone was, so i don’t feel so bad. Maybe putting out the pictures online like this might find some answers. My guess is that the picture shows Offspring 1 through 7 at the top of the picture–2 young men and 5 girls–and that the bottom group is the two youngest boys, Joseph and Henry, with 5 of their nieces and nephews–children of the older siblings. If the picture were taken about 1897, when the eldest son was 30 and the eldest girl was 27, this would make sense. The two youngest of the George and Margaret children would have been ages 4 and 6 then. Laurence and Lisa Hindley couldn’t figure it out, though they were sure that it is George and Margaret Jane flanking the children. So (maybe) our guess is as good as anyone’s. As I looked further in the Hindley posts if found this photo and this is the photo that I have. Thanks for identifying those in this picture. 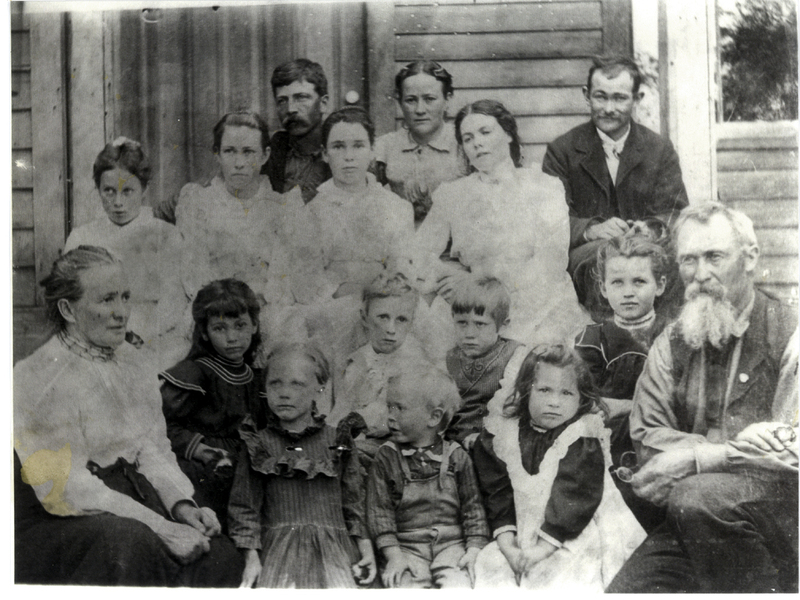 Walter Hackett is top left next to my great grandmother Annie Hindley Hackett. The boy in the middle bottom may be my grandfather George Hackett. If so the picture may be early 1900’s as he was born March 17, 1898. Thank you, John Michel! Annie Hindley Hackett sure looks like her mother! The boy in the bottom row who may be George Hackett… do you mean the one turning away from the camera? Thank you for helping us date the picture. If you don’t hear from me in a week or so, remind me to send you images of some of the other Hindley group pix we have. Emailing mattolehistory@frontiernet.net would be the easiest way to communicate.